In the March/April issue of Woodworker’s Journal, you’ll find options for putting your craftsmanship to work for your shop, your home – or your yard. A Folding Adirondack Chair offers improved storage for this classic outdoor piece, while a Weathered Wood Shelf and Mid-Century Modern Dresser provide easy-to-build accents for your home – or a loved one’s. Get back to basics in the shop by building your own Wooden Hand Plane, but don’t forget to take advantage of all the safety modern technology has to offer by learning about the best choice of dust collector to protect you from wood dust. If woodturning is your jam, you can learn a technique for turning bowls with a doughnut-shaped base; and, for the scroll sawyers among you, amaze your friends by creating three-dimensional objects via a compound cutting technique. For many of us, the weather outside is frightful, but that’s all the more reason to get out to the shop and work up some sweat making the projects you’ll find in the January/February 2019 issue of Woodworker’s Journal. Chris Marshall’s Router Table Organizer will help you maximize the empty space under your rolling table. Need even more shop storage? 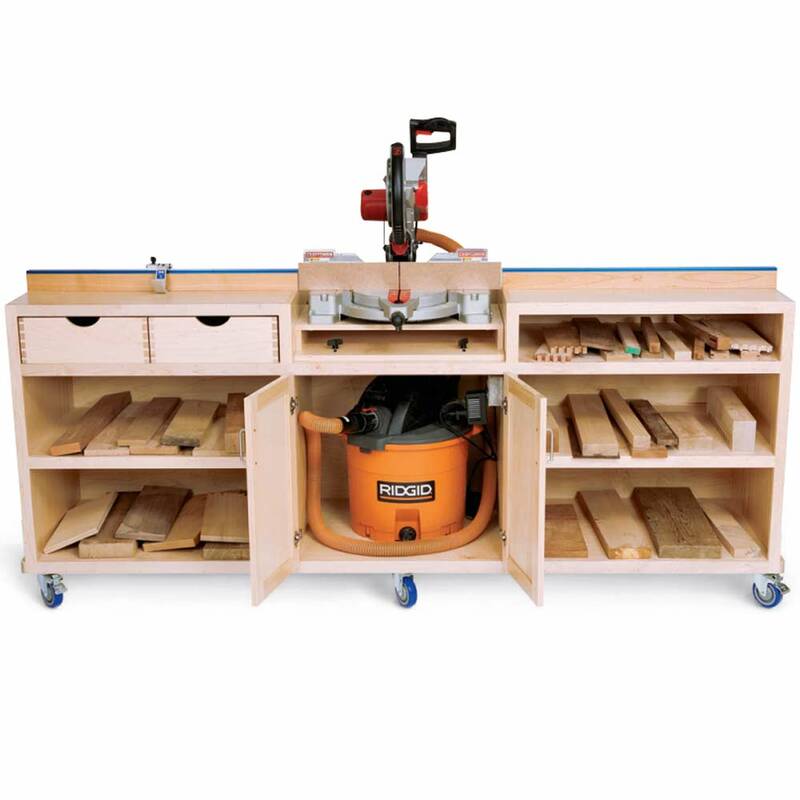 A Krenov-inspired shop cabinet will give you space to store all your hand tools. Our experts chime in with tips for the new year, including learning how to bore holes with your lathe, everything you need to know about the miter saw and thoughts on when (and where) to finish with shellac. Plus we have plans for a useful Contemporary Hall Table and instructions for making your own shop knives. You’ll find great gift ideas showcased in the projects found in the November/December issue. Whether your gift recipient is a cook who would love one or more of our Three Kitchen Gifts, a gamer who could play either side of our Reversible Gameboard, or an all-out decorator who will add our Holiday Spheres to the mix, you’ll find something for nearly everyone. We also have Turned Earrings for personal ornamentation and a showstopper of a Limbert Desk. Wrapping things up in the shop for the end of the year? Take stock of how you store your finishes, and find out what’s still going to be good going into January. Plus, learn all about the router – a tool that Chris Marshall claims could be of more use than a table saw. Three Kitchen Gifts: Reward your hungry helpers this holiday season with accessories for some popular foods: a Pizza Peel, a Pizza Cutter and a Taco Holder. Reversible Gameboard: Never lose your marbles – or your cribbage pegs – with this two-sided playing board, built for both mancala and cribbage, with a slide-out storage tray. Limbert Desk Reimagined: An upsized version of a classic plan from an Arts and Crafts master, this desk will give your woodworking skills a workout. Holiday Spheres: Use your scroll saw to cut the stacked rings and solid end pieces which are assembled into ornaments. Doll Cradle: You’ll rock as the gift giver of this retro-inspired item, made from only a few sturdy pieces. Woodturning: Turned earrings are a great gift idea – plus, you’ll learn to make your own tiny tools for teeny turnings. Tool Tutorial: Find out all the tasks the versatile router can tackle, the 10 basic bits you need, and the advantages of various sizes and configurations. The September/October issue of Woodworker’s Journal is full of information about your favorite hobby. You’ll learn about aspects of woodworking from how to easily cut dovetails by hand, to how to select the best band saw blades for your cut, to how to do the final turning on your now-dried green wood. Build a new Table Saw Outfeed Table for your shop, or a Classic Cherry Chest for your home. Learn how to do hot-pipe bending with a Curved Handle Serving Tray – and don’t miss our woodworking staff’s debate in our Questions & Answers section on the best way to drill for pilot holes. Table Saw Outfeed Table: YouTube personality Matt Cremona brings his live edge lumber to the shop with a slab-topped table saw outfeed table. We also present the option for a plywood top for this super-handy shop helper. Classic Cherry Chest: Hand-cut dovetails add a keepsake element to this moderately sized storage chest. Elegant Curved-Handle Serving Tray: Learn to create curves with the hot-pipe bending technique employed for this distinctive serving tray. Tool Tutorial: Learn band saw basics (what it can do, what to look for) and beyond (set up, safety and making the cut) in this overview of the shop workhorse from tool expert Sandor Nagyszalanczy. Woodturning: You’ve done a first turning, left your green wood to dry .. and now what? Now, it’s time to re-turn it to final shape, with the guidance of woodturner Ernie Conover. You’ll get some time in outdoors when you make the Shou Sugi Ban table from the July/August issue of Woodworker’s Journal – that’s where you do the Japanese charring technique – as well as when you set it up afterward. Looking for other exterior finish options? Check out Michael Dresdner’s Finishing Thoughts column. Back indoors, we’ve got projects like a Mission style Window Bench, a Waney-Edged Box with a stunning lid and Woodturning’s Small Hollow Forms. Plus, discover what you do – and don’t – know about your drill/driver. You’ll find it all in the July/August issue of Woodworker’s Journal. Shou Sugi Ban Side Table: A tried-and-true Japanese finishing technique chars wood to protect it from insects, rot and the elements – a great way accent the top and legs of this outdoor table. Limbert Window Bench: A reproduction of an Arts and Crafts era piece uses angled joinery to add visual interest. The upholstered cushion is optional. Waney-Edged Box: A box’s simple lines showcase the natural edge of the wood used for the lid. Plus, learn about regulations now affecting that species – and all the rosewoods. Tool Tutorial: The drill/driver is a standby tool, not just for woodworkers, but for homeowners, DIYers – just about everyone. Learn more about this basic from Chris Marshall, including why you care about amp/hours and whether you need a hammer drill or impact driver. Woodturning: Ready to move beyond the basics of spindle turning? Small, hollow forms are a fun next step — plus, these vessels can make great gifts. Finishing Thoughts: What do you put on your projects when they’re going to live outside? Michael Dresdner walks you through the options for exterior finishes. The May/June issue of Woodworker’s Journal has projects that will help you scratch that itch to get outside in the springtime: a quick-to-build Tabletop Fire Pit for your backyard gatherings and a Folding Bike Rack that has your wheels at the ready. Make an adjustment in your shop with the Router Lift Installation instructions, and learn about the shop standby tool with an overview of the table saw. Pick up some green wood drying tricks in Woodturning, and the technique for applying oil and varnish finishes in Finishing Thoughts. Tabletop Fire Pit: Get aglow about the outdoors with this easy-to-build tabletop fire pit, plus expand your woodworking skills to a new material as you route an aluminum plate for the fire pit top. Installing a Router Lift: Rob Robillard, the Concord Carpenter, walks you through a shop installation of Rockler’s cool new Pro Lift Router Lift into his his table saw’s extension table. Tool Tutorial: For many woodworkers, the table saw is the shop’s go-to tool. Learn from tool expert Sandor Nagyszalanczy about what this versatile tool can do, the features you’ll find, safety setups and usage tips. Woodturning: Can you speed up the drying time for green wood bowl blanks? Maybe … Woodturning expert Ernie Conover looks at the pros, cons and methodology of three techniques for faster or improved drying time. Delaware Chair: Kerry Pierce’s classic post-and-rung chair takes advantage of story sticks and jigs to mark off turned elements and make repetitions – for this chair or others – much easier. Folding Bike Rack: Easy-to-build storage for your two-wheeler keeps it ready to go in the garage or the back of the pickup, and folds down when not in use. In the March/April issue of Woodworker’s Journal, you’ll find projects like a Track Saw Jig to optimize your shop and a new take on the Adirondack chair for spring, with two of them built at barstool height. Learn all about the lathe, including what you should look for if you’re buying one, or put your woodturning skills to use by turning a Bird’s Mouth Bowl. Take a new approach to finishing with decorative pattern rollers, make loose tenons mimic the look of wedged joinery, or circle in on a Wall Shelf inspired by the rippling patterns of water. Tall Outdoor Chair Set: In this upscaled update of an Adirondack, the classic outdoor chair is reimagined in a barstool height, with connecting tables to complete the set. Track Saw Jig: If a track saw is your go-to tool for ripping and crosscutting, you’ll increase its efficiency even more with a jig that allows for repeatable precision – no more resetting the angle with every cut. Tool Tutorial: Learn all about the lathe – what it can do, what you need to look for, how to set it up, and more – from woodturning expert Ernie Conover. Finishing Thoughts: Pattern rollers and peelable coatings add to decorative finishing options for projects made with raw or painted wood. Decorative Wedged Tenon Bench: Create the look of wedged mortise-and-tenons with a plunge router and a shop-made jig. We give you instructions as well as a sturdy little bench that features the decorative loose tenons masquerading as their classic wedged cousins. Rippling Water Wall Shelf: The ripple effect is at work in this Weekend Project, both in the concentric circle details (created with a circle-cutting jig) and in the skills you’ll develop (cutting glass, for one) for use with future projects. Start your new year off right – in your shop. In the January/February issue of Woodworker’s Journal, you’ll find a mixture of classic projects – from a Coatrack to a 5-Drawer Tool Chest – and modern trends, like a Tripod Floor Lamp and an updated take on the iconic Rocking Chair. Bring out the natural beauty of your wood by learning to turn natural edge bowls, expand your tool knowledge with an overview of the scroll saw and sharpen your woodworking skills with a lesson on resawing on the band saw. 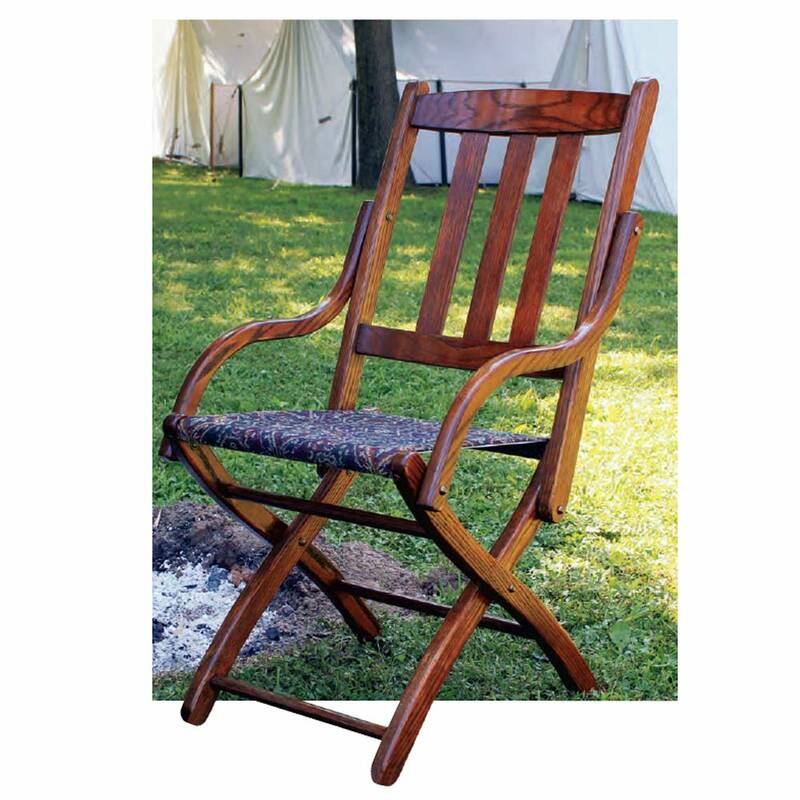 Modern Rocking Chair: This updated take on an American classic uses wooden dowels to support and separate the seat from the side assemblies. Tripod Floor Lamp: A trendy three-legged lamp that’s easy to make with handheld tools, home center lumber, and a gang sanding technique. Tool Tutorial: Our tool experts introduce you to the basics and beyond of woodworking tools. First up: scroll saw expert Carole Rothman highlights how this tool can do way more than you ever thought it could. Woodturning: Bowls turned with a natural edge highlight the tree’s bark and other natural, organic features. 5-Drawer Tool Chest Till: Author Ernie Conover designed this partitioned box to protect his carving chisels, but you could find many uses for the small storage container featuring interior drawer dividers and a dadoed carcass. Classic Coatrack: The reverse inlay technique featured in this practical household addition might trick your eye into thinking the thin, light strips are inlaid into the darker walnut, but our easy instructions mean it won’t be a trick to achieve. It’s the time of year when there’s an outpouring of generosity from woodworkers’ shops – and why not, when great gifts are such fun to make? In the November/December issue of Woodworker’s Journal, you’ll find the project plans and know-how to create some snazzy-looking Cutting Boards, a woodturned Kitchen Canister, a picture-frame inspired jewelry storage option, and even some bigger items like a Bookcase or Music Stand. Put your CNC to use creating some gift projects (traditional drawings also available), spread out your holiday baking on a retro-styled Folding Table, and find out the newest options in aerosol finishing as you get out the spray cans for the finishing touches. Wooden Music Stand: Sandor Nagyszalanczy’s gracefully curved stand boasts an optional hanger for a guitar (or other instrument), an adjustable music holder and sawn and steambent legs. Techniques: Marlen Kemmet creates artful cutting boards from glued-up laminates. Woodturning: Ernie Conover teaches you how to create a spindle-turned hollow form canister – no fancy specialty tools needed. Red Oak Bookcase: With standard home center lumber and just a few power tools, you can create a handsome bookcase with an Arts & Crafts-inspired style. Circular Jewelry Frame: Put those pretty scraps of wood to good use with this gift project. Chris Marshall shows you options for cutting your circle on either a router or a band saw, plus includes details on his angle-cutting jig for making miters. High-Tech Gifts: Looking for options for quick gifts? Here’s a roundup of easy-to-make ideas, complete with CNC files – or, for those of you who are still “old-school,” downloadable drawings. “Retro” Folding Table: Be prepared for parties, puzzles and more with Kimberly McNeelan’s card table kicked up a notch. From showstoppers to practical solutions, you’ll find it in the September/October issue of Woodworkers Journal. Make an impact with a Slab Top Dining Table featuring the most spectacular piece of wood you can find (we’ll tell you how to deal with all those little “imperfections”), or craft a stunning Sideboard. Set up a snack station in your shop with our kitchenette Cabinet, and feed the furry family members, too, with a Dog Food Station just for them. Plus: applying flat finishes, updates in battery technology, a jig for making mortises, and more. Mid-Century Inspired Sideboard: With an ash exterior and walnut accents, plus interior, this contemporary styled sideboard uses straightforward joinery (mortise-and-tenons, dadoes, grooves and rabbets) to create a stunning storage piece. Slab Top Dining Table: Showcase a beautiful piece of lumber as the topper for this table – we walk you through the options for dealing with the special challenges presented when working with this cut of wood. Workshop “Kitchen” Cabinet: It’s no secret that snacking takes place in the shop from time to time. This practical addition gives you a “kitchenette” for a shop (or dorm room), using practical laminate plywood (aka “cabinet liner”). Dog Food Station: Feed Fido in style with this two-part dog food station: a storage box with a hinged lid provides a place for your dog food and accessories, while a dog dish holder elevates the food and water bowls for easier access. Today’s Shop: Today’s tool batteries give a high-voltage performance. Features include longer runtimes, cool running, brushless motors and more. Woodturning: No four-jaw chuck? No problem! Learn to turn a bowl with your lathe’s faceplate plus some glue blocks. Find projects for your home, your shop and your summer excursions in the July/August issue of Woodworker’s Journal. A Prairie Style Box and an Odds and Ends Cabinet can both fulfill a variety of functions, while our Picnic Basket -- with wheels! – is ready to hit the road. A Portable Mini Workbench can follow you outside, too. Our regular columnists give you even more info, with Michael Dresdner introducing you to techniques for six different texturized finishes, and woodturner Ernie Conover helping you create a precise measuring spoon with both spindle and faceplate turning. Picnic Basket: Pack up the picnic basket for a summertime outing! This version is traditional with a twist: author Sandor Nagyszalanczy achieves the woven wood look without the need for steam bending, and adds wheels and a pull-out handle for easier transport of all your outdoor eating supplies. Jigs & Fixtures: A Portable Mini Workbench provides a work surface for small spaces or easily transports outside. Laura Kampf shows you how to build this handy helper. Prairie Style Box: Equally at home holding jewelry or other trinkets, this architecturally styled box has beveled edges on the lid, lift and legs. Surfboard Coffee Table: The elliptical top of this Mid-Century style accent resembles a surfboard. Learn to work with mixed materials – an aluminum base supports the wooden tabletop – while creating this beachy accent for your home. Odds and Ends Cabinet: Screws, other small fasteners … all sorts of odds and ends. You know you have them, and they’re taking up space in your shop. This cabinet provides you with a place to put them – and introduces you to a blade that provides a new way to make interlocking miter joints. Today’s Shop: Need to make a bevy of box joints? Chris Marshall gives you an up-close and personal look at the purchase options out there for manufactured box joint jigs. As spring turns to summer, the May/June issue of Woodworker’s Journal looks to the outdoors, with projects ranging from a relaxing Porch Swing to a turned Birdhouse, plus a Hanging Herb Garden. Instructions on building a Small-Scale Dehumidification Kiln help you save money on your woodworking lumber, right in your backyard. Plus, our woodturning columnist provides a review of today’s mini and midi lathes. Tool Review: Woodturning columnist Ernie Conover examines the latest in 10” mini and 12” midi lathes: what’s new, what’s important, and what’s best for your shop. Summer-Ready Porch Swing: With built-in cup holders on both arms plus a contoured seat and back meant for relaxing, this outdoor addition will add some simple pleasures to many summers to come. Hanging Herb Garden: This rack of modular planters can hang from your deck, your fence, or even a sunny outdoor wall. Worried you’ll forget to water? Author Sandor Nagyszalanczy shows you to how install a drip irrigation system. Woodturning: A barrel-shaped birdhouse teaches you the coopering technique of stave construction while providing, depending on finish choice, an outdoor home for your feathered friends or an inside addition to your décor. Graceful Bar Cart: An accessory for entertaining with a top tray that removes for serving, built-in holders for stemware and wine bottles, and caster wheels for moving easily from one part of the party to the next. Small-Scale Dehumidification Kiln: If you’ve always wanted to dry your own lumber, this article’s for you. Learn how to assemble and use a shed style kiln. The March/April issue of Woodworker’s Journal takes on projects for your home head-on. From the newest version of a fold-up Murphy Bed, to a Bathroom Vanity that can be adjusted to fit your plumbing, to a Shoe Storage Rack that will serve your entryway well, you’ll find home projects that are both practical and pretty. This issue also contains a clock with two timepieces, information on how to use a vacuum veneer pump and instructions on applying varnish. Our woodturning columnist revisits traditional techniques for harvesting the wood that will create freshly turned spindles, while we also introduce you to tools that incorporate the most modern Internet-connected technology. Murphy Bed: An updated version of the classic space-saving foldaway bed, with optional matching side cabinets. Bathroom Vanity: A beautiful veneered grain pattern on the false fronts of Anatole Burkin’s bathroom fixture creates the illusion of symmetry. In reality, you can customize the fit of the three graduated drawers to your own house’s plumbing. Shoe Storage Rack: Store your shoes in style with this red oak storage rack, which also provides benchtop seating. Author Sandor Nagyszalanczy’s tips to combat wood movement come in handy when creating a project from a handsome hardwood. Thinking-of-You Clock: In this case, two faces aren’t a bad thing: one clock keeps track of your own current time, while the other clock face ticks away the time in a faraway loved one’s locale. You’ll also find a chalkboard inset handy for messages and reminders, plus a place to keep your keys. Woodturning: Want to turn spindles from green wood? You can, as long as your wood has a complete annular ring. Learn how to harvest wood to get that result, plus tips for turning that green wood spindle. Technology & Woodworking: Everything’s connected these days – including tools. Chris Marshall introduces you to mobile apps for batteries and power tools that can provide diagnostics, tool tracking, dial-in settings and more. In the January/February issue of Woodworker’s Journal, you’ll find classic projects with an updated twist to start your shop year off right. What better addition to your shop than a solid new Workbench? 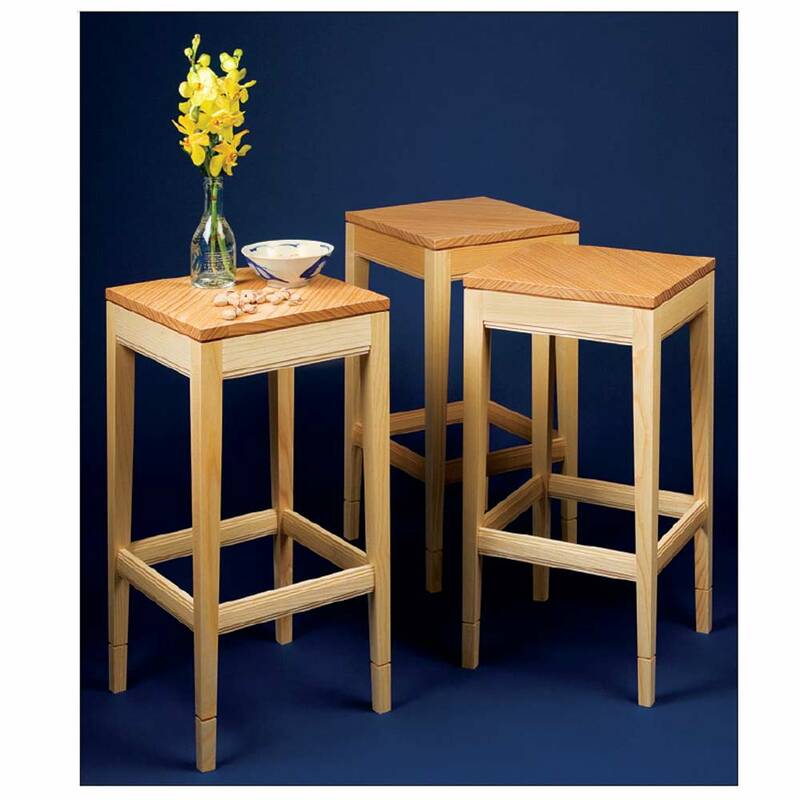 Or, perhaps you’d like to start off smaller, with a Chairside Caddy or a Classic Step Stool? The Spade Bookcase has a classic Arts and Crafts design, while a knockdown Finishing Turntable is another handy addition to your shop. Is improving your shop skills among your New Year’s resolutions? Start off by learning six methods of circle-cutting, plus find out how to use stain to “upgrade” your wood. In the November/December issue of Woodworker’s Journal, you’ll find plenty of projects designed to turn your shop into “gift-making central” for the season. Look at this issue’s Holiday Gift Section, and you’ll learn how to make a Band Saw Box designed by David Picciuto, highlight your best family photos with an Inlaid Picture Frame, or stock up the kitchen with accessories like a Banana Hanger, Pasta Serving Set and a handy set of Tongs. Wondering how to finish wood items that will touch foodstuffs? Our finishing expert Michael Dresdner has that covered, while Sandor Nagyszalanczy shares tips and tricks for making sure your hardware looks handsome when you add the final touches to your projects. In the September/October issue of Woodworker’s Journal, you’ll find projects like a Mid-Century Modern Nightstand and 19th Century Drop Front Desk that hark back to earlier times but work just as well for today’s uses, plus get the latest news on new tools like the JET JWSS-22 Scroll Saw, Festool HK 55 Portable Circular Saw, Triton TWX7 Workcentre and NOVA 18” Voyager DVR Drill Press. And, whatever you’re building, you’ll find Sandor Nagyszalanczy’s tips and techniques for accurate measuring to be invaluable. All this, plus a Shaker Chair, a Portable Board Game Storage Box, tips on making identical turnings, and more. In the July/August issue of Woodworker’s Journal, you’ll find summertime projects like a Beehive and Turned Grilling Tool Handles, as well as projects to make your house a home when you shift back inside. Read about your options in cordless brad nailers, learn how to incorporate the ancient proportions of Greek columns into your modern woodturning, discover how to correctly paint your solid body electric guitar, and more. Beehive: Do your part to save the pollinators by providing your bees with an upscale home that includes shop-made tapered lap siding. Turned Grilling Tool Handles: Demonstrate your mastery of the grill and the woodshop when you baste, flip and remove your items using a brush, spatula and tongs that feature handles you’ve turned yourself. Lighted Bookshelf: The hardware used to mount this shelf to the wall makes it appear to be floating in air, while the sliding dovetails on the bookends that support your reading material can be adjusted along the length of the shelf to store more, or fewer, books. Recesses on the bottom hold a couple of lights. Upholstered Ottoman Chest: It’s a seat, it’s storage, it’s a place to rest your feet … Sandor Nagyszalanczy’s Ottoman is all this and more, with its hollow interior, reversible lid (the other side’s flat, to be used as a tabletop) and upholstered top. Technology & Woodworking: Bosch’s new REAXX Portable Jobsite Table Saw offers a new approach to skin-sensing technology. Tool Review: Chris Marshall takes a look at the new crop of battery-powered 18-gauge brad nailers. 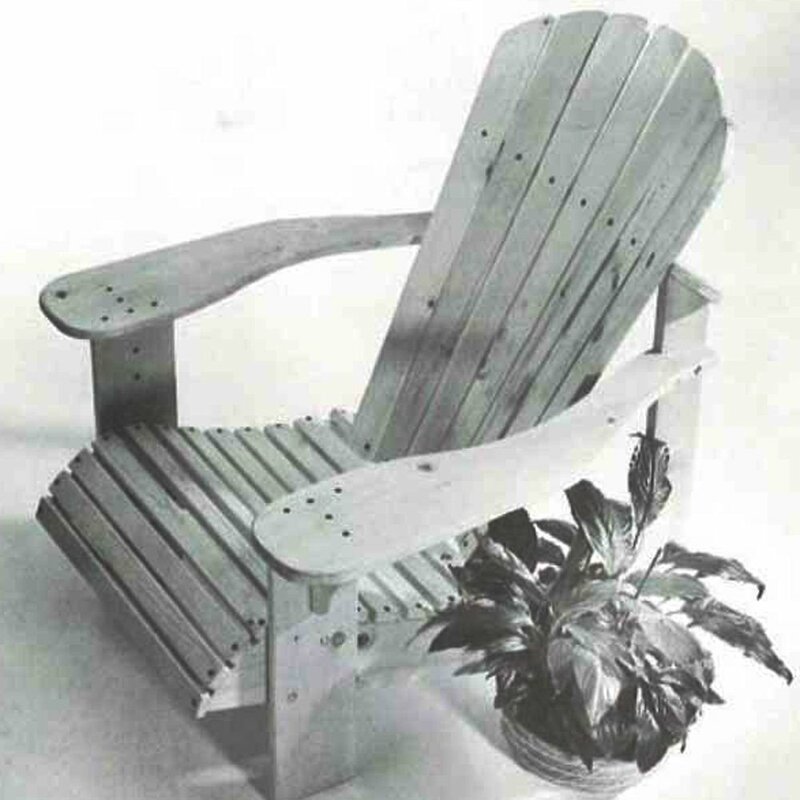 In the May/June 2016 issue of Woodworker’s Journal, you’ll find projects for indoors and outdoors, including an Adirondack Chair perfect for your yard and another chair that brings the romance of the water inside. Learn about apps and online tools that can enhance your woodworking; build helpful jigs for your shop or buy the ones our experts recommend; find out the surprising things woodworkers said about their cordless drills, and more. The March/April 2016 issue of Woodworker’s Journal takes on shop tools big and small, with a cabinet meant for storing portable tools, a review of 8” jointers and a reader survey all about the table saw. You’ll also learn the technique of double bevel marquetry, be introduced to an affordable 3D printer, and build a beautiful End Table. The January/February 2016 edition of Woodworker’s Journal showcases projects ranging from a bookcase you can build in a weekend, to a work station for your garage, to a stunning Arts & Crafts style dresser. Plus, learn about turning pens, what it takes to get a glossy finish, and our turning expert’s opinion on how you can make money with your hobby. The holidays are fast approaching, and the November/December 2015 issue of Woodworker's Journal has you covered. Build a keepsake box, jewelry box, carousel toy, lamp and plant stand, and check out the latest in cool woodworking technology. As the weather starts to cool off, heat things up in your shop. Our latest issue brings back a reader's favorite heirloom bookcase, a wall mounted wine rack (with a bottle stopper), a slab top table, an outfit table, plus information on taking up turning, new tools and more! Hot off the presses for July/August, this issue features a stylish new picnic table, a Greene and Greene Nightstand, privacy shutters for your windows and a look at a cool tool to help you route dovetails. Our latest issue features plans for a miter saw station, counter-height bar stool, curved front vanity, and a canoe paddle. We also review jobsite radios and share a list of great Father's Day gift ideas. Build projects with both modern and classic styling; increase your productivity and upgrade your shop skills with a framing jig and instructions on using a steady rest; easily create a curved laminate; and check out the choices for the best 10” sliding compound miter saw. You’ll find all this and more in the March/April 2015 issue of Woodworker’s Journal. Build a spectacular Greene and Greene-inspired Bed, maximize your shop space with an extension for your router built onto your shop’s table saw, and check-in for our 2014 Reader’s Choice Awards. All that and much more can be found in the pages of the January/February 2015 issue of Woodworker’s Journal. Create custom spoons and knives, build some toys and gifts, and catch up on the latest planer/jointers and spray guns, the November/December 2014 issue will keep you busy in the shop this winter. 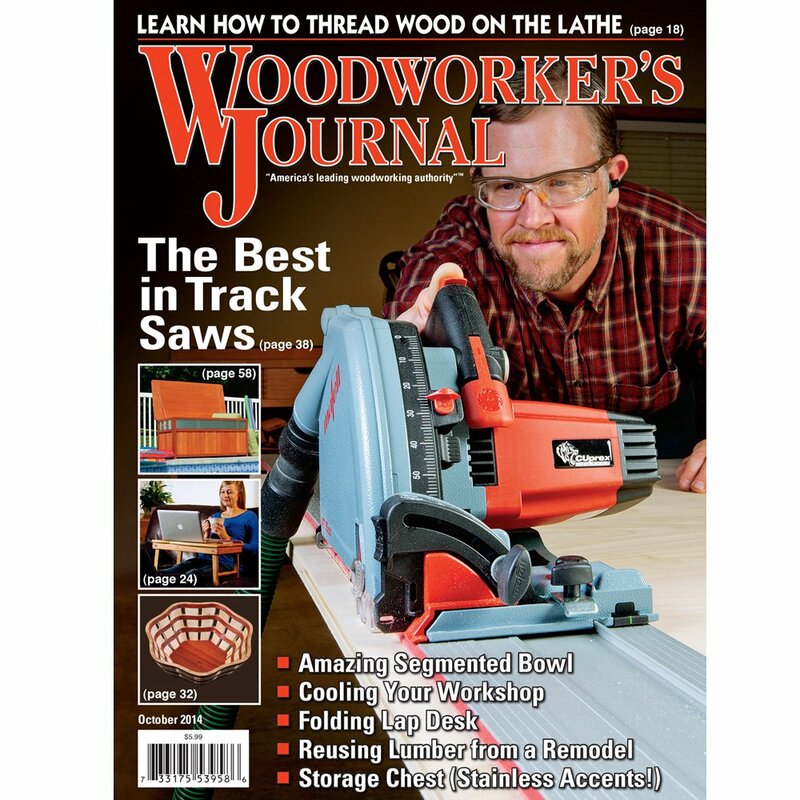 Check out the latest in track saws, learn how to build a handy lap desk and keep your shop cool in the September/October 2014 issue of Woodworker's Journal. Making an impressive dog bed, a croquet set, or a compact hobby desk are just some of the ways we suggest you spend your Summer in the latest issue of Woodworker's Journal. As the summer months slowly approach, Woodworker's Journal offers some cool new projects like our Full Length Mirror and a 19th Century Shaving Box, plus our band saw reviews and five of our best finishing tips. Check it out in the May/June issue of Woodworker's Journal. As the weather starts to warm back up, Woodworker's Journal helps you get back into the shop with a Classic Bookcase, an interesting Wall Lamp, a simple, but effective Bedroom Valet and an Art Deco Cabinet perfect for your small shop. All that and much, much more (including tips on keeping your shop warm right now!) in the March/April 2014 issue of the Woodworker's Journal. The Jan/Feb 2014 issue of Woodworker's Journal Magazine bridges the past and the future. Rob Johnstone recycles some old material for a cool cabinet, while Sandor Nagyszalanczy peers into the future of computer woodworking. Plus a lot more! In the November/December 2013 issue of Woodworker's Journal magazine, we'll help you get out of the cold and into the shop with some wonderful gift ideas fit for the holiday season. As the Summer starts to wind down, the September/October issue of Woodworker's Journal Magazine has you covered with plans like A.J. Hamler's Civil War folding table, a Veneer Paneled Blanket Chest, Ernie Conover's guide to setting up your turning shop and much, much more! The July/August issue of Woodworker's Journal Magazine features projects and tools for shops small and large, from building a stunning silverware case in your basement to huge equipment for milling your own lumber. Many of us are still stuck in the cold, but the May/June 2013 issue of Woodworker's Journal will have you thinking about your summer woodworking projects. Spring into your workshop with the March/April 2013 issue of Woodworker's Journal magazine, with plenty of projects to keep your small shop running well into the summer. The January/February 2013 issue of Woodworker's Journal magazine contains plenty of content to keep you busy in the shop during winter months and beyond. 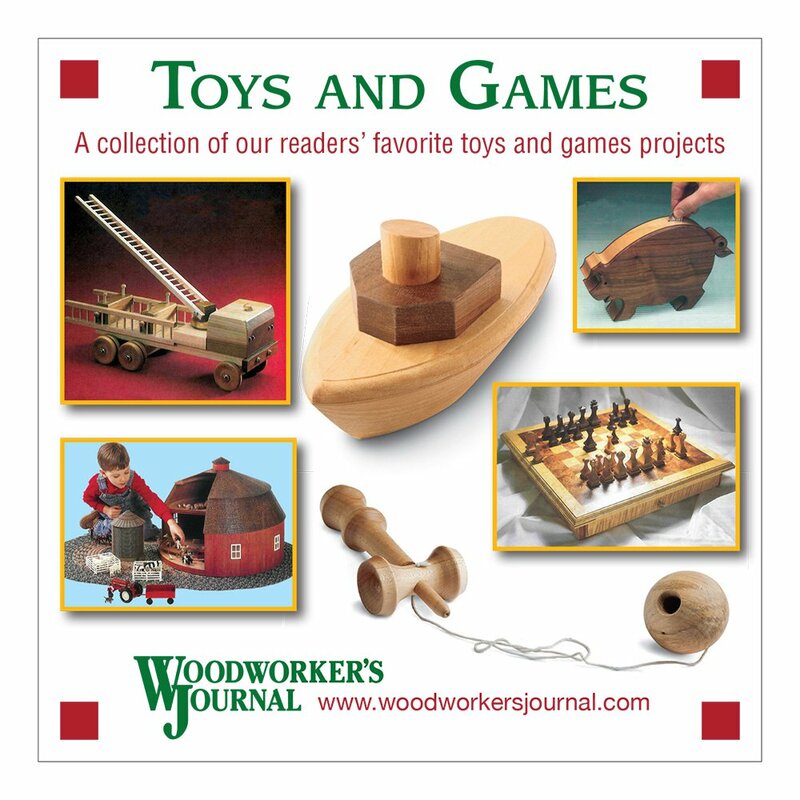 The December 2012 print issue of Woodworker's Journal offers three unique projects tailored for filling your gift list or for trimming the tree. If you're looking for a sensible, yet challenging piece of furniture to build this fall, our September/October 2012 issue has you covered. Take a tour of the great woodworking content you'll find in the July/August 2012 issue of Woodworker's Journal magazine. Field Editor Chris Marshall takes you on a quick tour of summertime projects and tool news in our May/June 2012 print issue of Woodworker's Journal Magazine. Rob Johnstone discusses what you'll find in the March/April 2012 issue of Woodworker's Journal magazine. 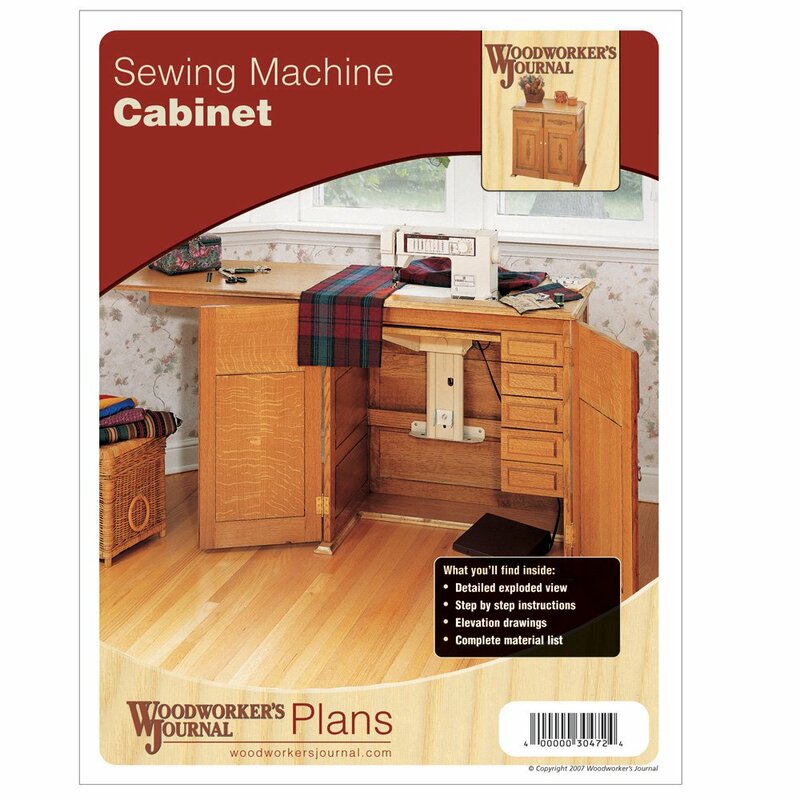 A walnut bench, a sturdy bookcase, a review of new drill/drivers and some of the top saw accessories are featured in the January/February 2012 issue of Woodworker's Journal magazine. A Mission Coffee table, a sneak peak at the 2012 tools season and some holiday gift ideas warm up your shop in the November/December 2011 issue of Woodworker's Journal. The Woodworker's Journal staff brings you an Ultimate Planer cart, a beautiful jewelry cabinet, a look at scroll sawing on a budget and more in the September/October 2011 issue. 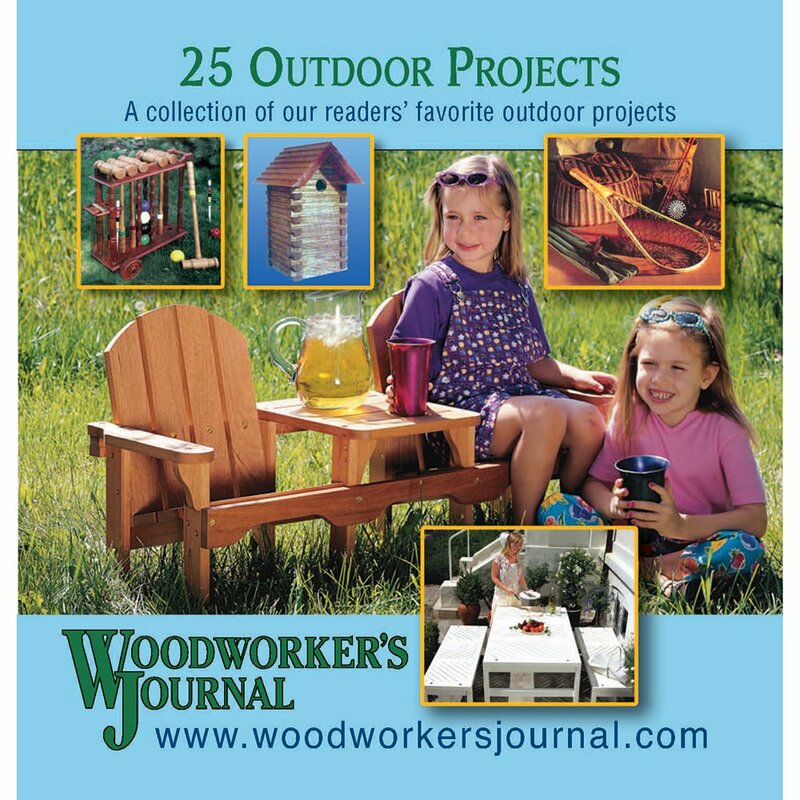 The July/August 2011 issue of Woodworker's Journal takes you outdoors with a classic Adirondack chair and some great tips for finishing your outdoor projects. Our experts take a look at combo nailer kits, jigsaws and dive into furniture with a Mission coffee table and a stunning Shaker dresser. 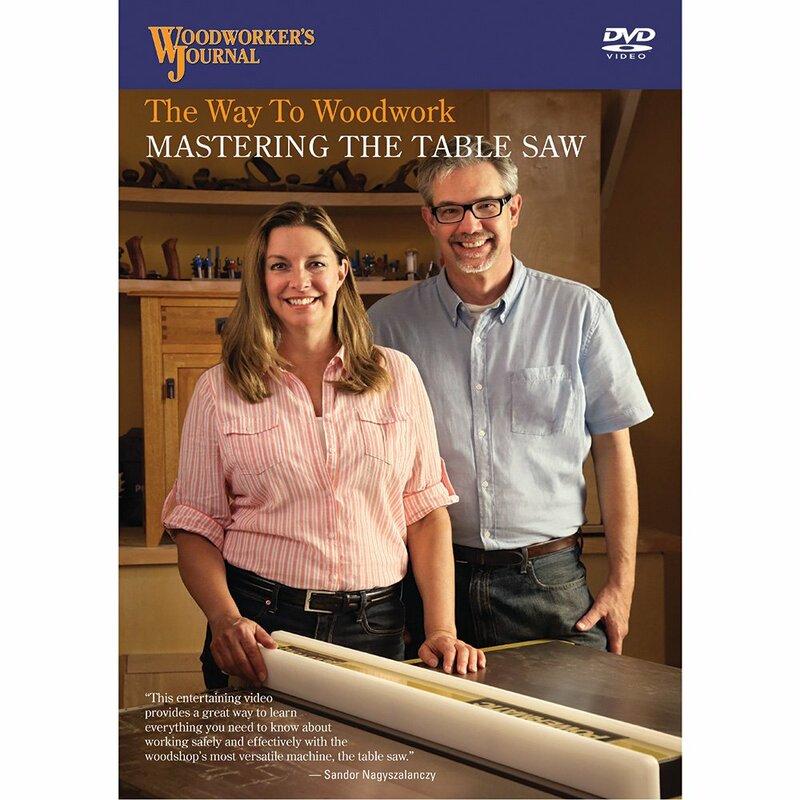 In the March/April 2011 issue of Woodworker's Journal, we take a look at saw blades, digital tool accessories and a great Walnut chair plan. A Classic Bookcase, a review of top-shelf Benchtop Drill Presses and Ian Kirby's "Three Tenets of Good Design" are featured in the January/February issue of Woodworker's Journal. In the November/December 2010 issue of Woodworker's Journal: Building a Waney Edge Box, Some Holiday Gift Ideas and Our Best Router Tips. A Game Table with a twist, a look at benchtop planers and some shop safety tips are just the start of what you'll find in the September/October 2010 issue of Woodworker's Journal. Features on Shaker Furniture, benchtop mortisers and outdoor projects and finishing lead the way in the July/August 2010 issue of Woodworker's Journal. The May/June 2010 Issue of Woodworker's Journal brings you an easy to build Kitchen Island, the Ultimate Miter Saw Stand and a look at oscillating spindle sanders and much, much more. In the November/December 2009 issue of Woodworker's Journal, it's Routermania: top router reviews, dovetail jigs as well as some cool projects. A Convertible Coffee Table, a look at green finishes and an Adjustable Tenoning Jig and more can be found in the September/October 2009 issue of Woodworker's Journal. Build a Fly Rod, organize your workshop and add a Wall Mounted Panel Press to your home in the July/August 2009 issue of Woodworkers Journal. It's woodworking on a budget in the May/June issue of Woodworker's Journal, with home-made Shop Pulls, a budget Outdoor Table, and an ultimate small shop Router Table. 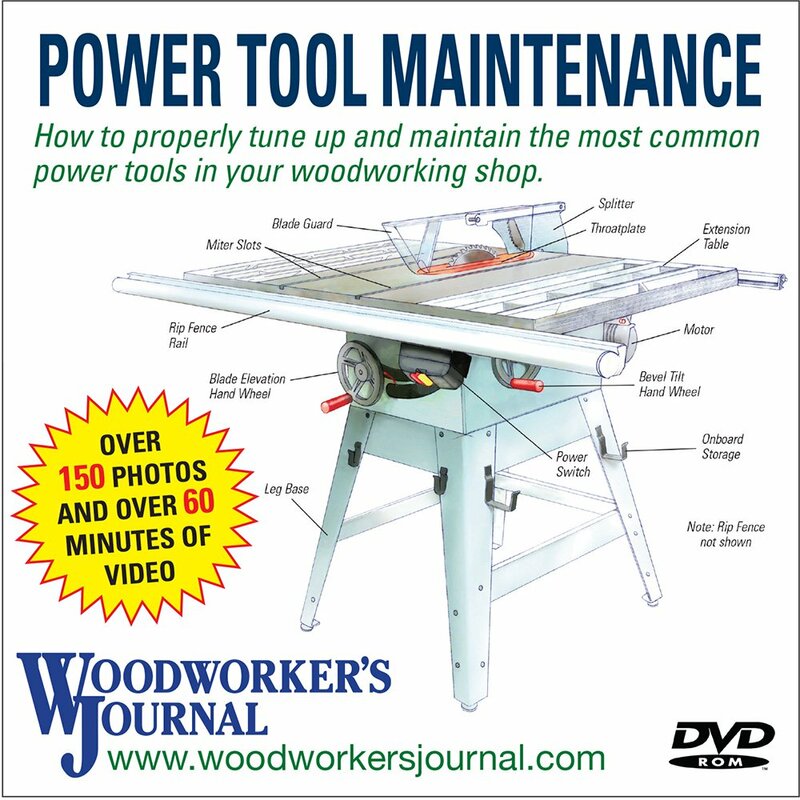 In the March/April 2009 of Woodworker's Journal, you'll get a look at the All-American table saw, build a Classic Drop Leaf table and round-up all the clamps we could get our hands on. January/February 2009's Woodworker's Journal features a cool Candlestand Table, a comfortable Floating Platform Bed and a Fold-down Outfeed Table for your shop. What are the 10 coolest router bits? How do you build a perfect Entry Bench? What's the secret to power waxing? Find the answers to these questions and more in the November/December 2008 issue of Woodworker's Journal. Organize your shop with the September/October 2008 issue of Woodworker's Journal, we've got a fold up Router Table, a Router Bit Storage center and take a look at space and money saving jointer/planer combo kits. Take to the shop with the July/August 2008 issue of Woodworker's Journal. We test 19 top random orbit sanders, build an Arts & Crafts Bookcase and teach the pen turning process step-by-step. In the May/June 2008 issue of Woodworker's Journal, we take a look at a classic American Tool Chest, a weekend Greenhouse project, and some of the best sliding miter saws out there. Follow some expensive wood from harvesting in Africa to a shop in the U.S., build a new set of kitchen cabinets, learn about 15" planers and more in the March/April 2008 issue of Woodworker's Journal. Learn about drill presses, biscuit joiners and build a Band Saw Box in nine easy steps with the January/February 2008 issue of Woodworker's Journal. 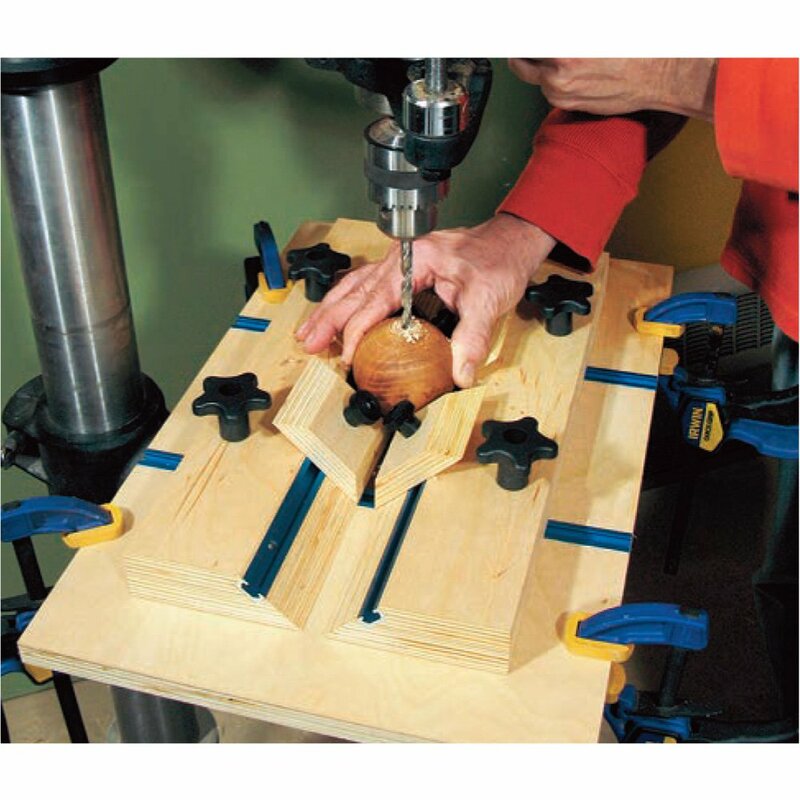 In the November/December 2007 issue, the Woodworker's Journal staff takes a look at some top router bits, lifts and tables, make some Holiday Ornaments and design a pair of cool Tables. 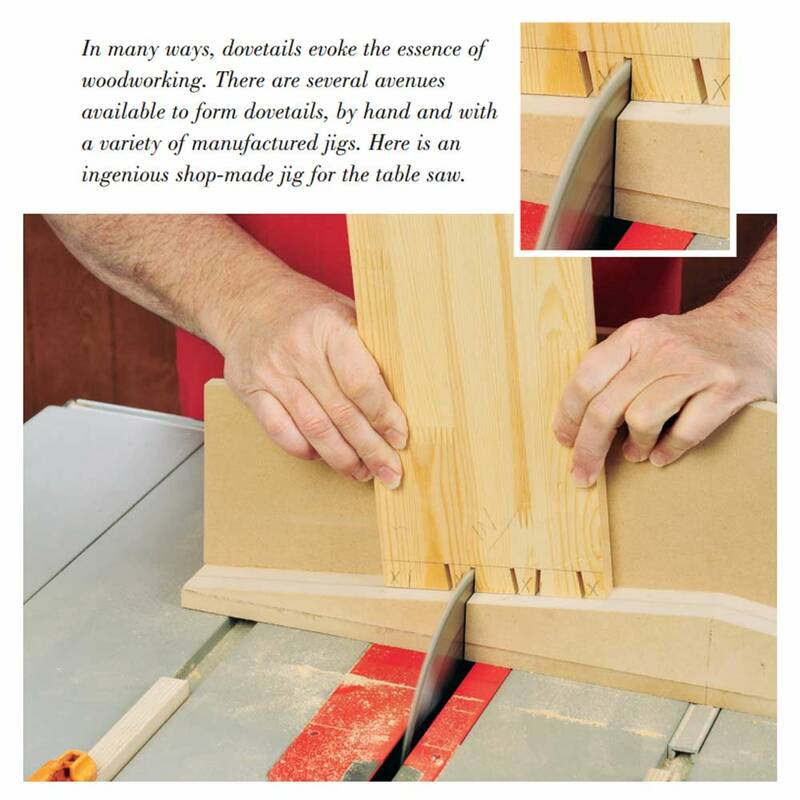 In the September/October 2007 issue of Woodworker's Journal, we caution you against the 7 Deadly Woodworking Sins, take a look at jig-based joinery and create a perfect miter. Extreme Woodworking, Lithium-Ion Tools and and an Eclectic Blanket Chest are among the interesting things you can learn about in the July/August 2007 issue of Woodworker's Journal. Make a Torsion Box with Ian Kirby, learn more about HVLP Spray Guns and learn some tips for getting the most out of your circular saw in the May/June 2007 issue of Woodworker's Journal. Norm Abram goes unplugged in the March/April issue of Woodworker's Journal. Also in this issue? Take a look at eight great nail guns, build a Bathroom Vanity project and more. Peer into the future of woodworking with CAD drawing programs, learn about our most amazing jig yet, and we tackle a myth about band saws in the January/February 2007 issue of Woodworker's Journal. The November/December 2006 issue of Woodworker's Journal is a router overload! We look at router techniques, the best trim routers out there as well as a few cool projects.